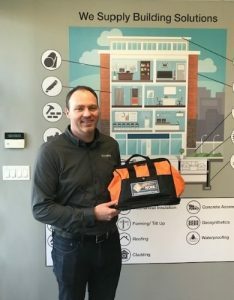 Congratulations to Rob Mutch from Brock White Canada, who entered our draw at the ConcreteBC conference and won a vehicle safety kit with one year of roadside assistance. This conference provided delegates with a variety of presentations such as Policy to Set the Roadmap to Resiliency, Financial Intelligence for Producers: Market intelligence, Commercial Vehicles Environmental Standards – What’s on the Horizon, BCTA’s Perspective on Workforce Development, NRMCA Industry Survey Results and Cannabis, Now What. Delegates also had opportunities to network and to check out the trade show booths. Thank you to everyone who stopped by our booth to chat about road safety. Rob is a sales manager for Brock White, a professional grade construction materials supplier. He understands the risks involved with being on the road and wishes that all employers would help their staff to adopt safer driving practices. Rob was not familiar with Road Safety At Work until we met him at this conference. He was very pleased to learn about the great tools, resources and online courses available at the Road Safety at Work, ConeZoneBC and Shift into Winter websites. Rob plans to spend more time looking at these resources and sharing information with his employer.